Ships within 24 hours from our office in Vancouver. 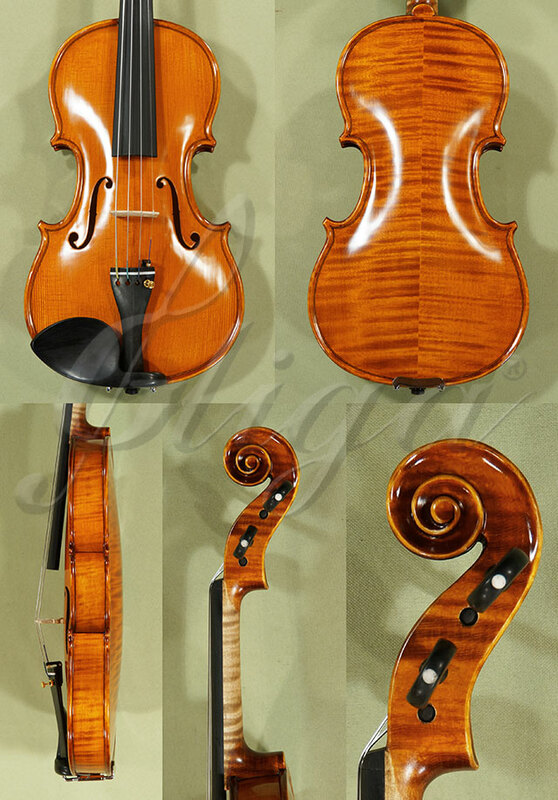 All Gama Professional violins are HANDMADE by the best luthiers in Gliga's workshop. Each instrument is accompanied by a certificate of authenticity, which confirms that the instrument meets all the design, manufacturing, finishing, and set up requirements that define the GAMA Professional level. All Gama violins are finished with a special formula of German oil-based varnish, whose elasticity factors have been perfected to allow the fibers of the wood to vibrate freely and produce extraordinary sounds, while ensuring an optimal wood protection. The Gama Professional Violins are usually chosen by advanced players, adult amateurs who play the violin as a hobby, orchestra players, and anyone else who wants to own and play a fine violin. The Gama violins are superior to those listed under the Gems 1 level by the wood quality and aesthetic value, manufacturing process, finishing style, and accessories. All these elements are of superior quality, which have a direct influence on the quality of the sound. A standard GAMA violin is set up with Thomastik Dominant strings and a standard tailpiece with one fine tuner. To change these settings, use the options at the top of the page. To select a case and a bow go to the top left menu and choose these items independently, or you can use these links for a 1/2 violin case and a 1/2 violin bow. All items will be shipped at once, in the same package. Click the button below to add the 1/2 Gama Elite Violin Code C8549V to your wish list.